Citrus Alarm Clock is a software alarm clock that helps you wake up relaxed and on time. Citrus uses your own music collection and you can choose songs individually or organize them into shuffleable playlists. When it's time to wake up, Citrus will automatically wake your computer from its low-power sleep state and gently fade in your music so you're not startled awake. You can even set different alarm times for different days. If you want to rest a little longer, just tap the space bar to snooze, or keep a wireless mouse at your bedside and press the middle button, just like a bedside alarm clock. CradleAlarm supersedes the poorly featured alarm clock of Windows Mobile. 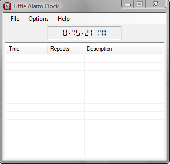 CradleAlarm supersedes the poorly featured Alarm Clock of Windows Mobile. With this application you can set multiple alarms, that provide a large number of settings to let you start your day as pleasant as possible, to remind you of an appointment or many more. pTravelAlarm is a multi-function alarm clock for your Windows Mobile device. The coolstuff alarm clock is designed for Windows Mobile devices to make a loud sound at a specific time. It supports 5 alarms with different times for different days, plays WAV sound files with customized volume. Make your own clock with your favorite image picture and share it with your frields. It is a useful and convenient program for the user of a personal computer. This program has 2 big functions: 1. The collector notes is very useful function! 2. The Alarm clock. A customizable alarm clock to remind yourself of important events, or simply wake yourself up! Analogue Vista Clock is an outstanding quality alarm clock for your desktop. It comes with six awesome, real time rendered vista-style skins, and you can download more. It can play one of it's build-in alarm sounds or any other external sound file. Alarm Clock-7 is program that displays the current time on desktop like analog seven-segment clock faces.